For all Babyologists firmly entrenched in camp dog (as opposed to camp cat), we’ve rounded up some of our favourite puppy finds for the toy box – come see what has us wagging our tails! 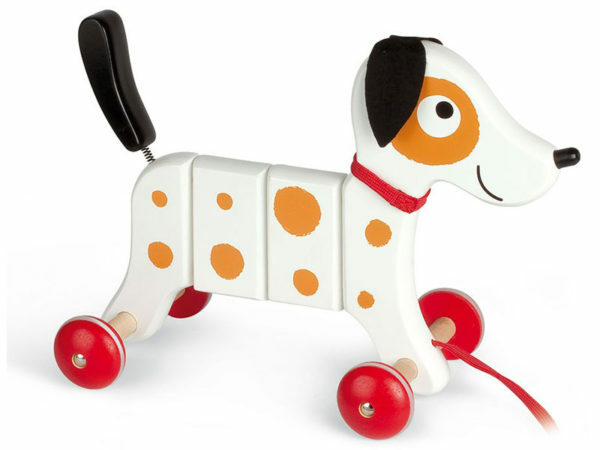 Perfect to encourage first steps, a bright and cheerful walker and trolley combination – the Crazy Doggy Cart. Teddy will love rides in this one! Find it at Good To Play, $109.45. Perhaps one of the most recognisable dogs getting around, Toy Story’s Slinky Dog holds a place dear to my heart. 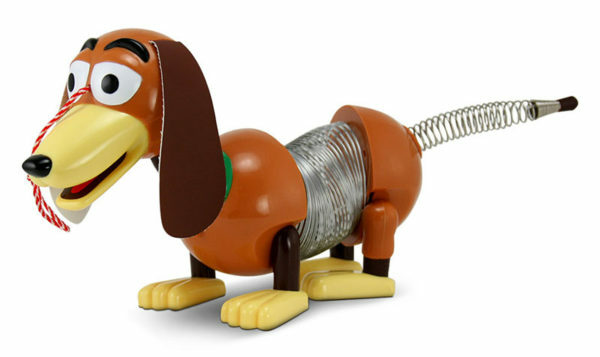 Find Toy Story 3 Slinky Dog at Toys R Us, priced $40. Joining the line up of cute as a button Maileg mice, are these dapper doggies. 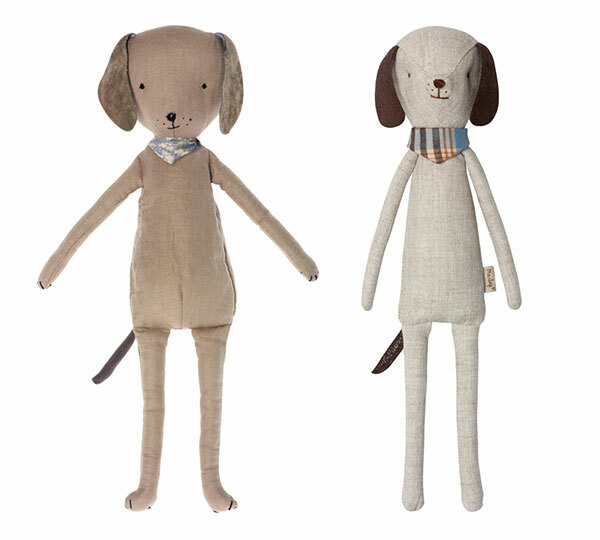 Best Friends Dog, $64 and Mini Doggy, $49 are both as cuddly as can be. Find them locally at Pip and Sox. 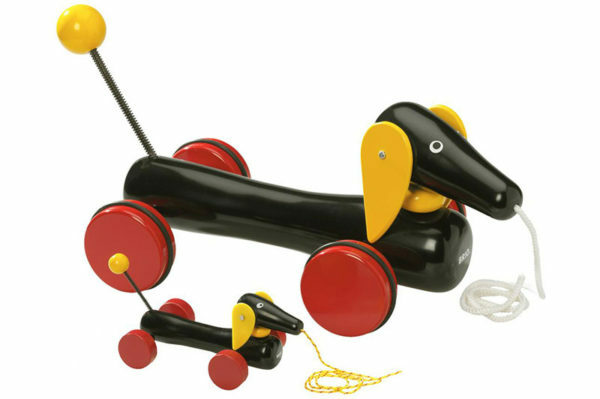 We adore the retro vibe of Brio’s dachshund toys! Available in two sizes, the large, 50cm long, sleek coated Brio Dachshund with pull cord is available at Purple Turtle Toys, $133.95. For lovers of all things Danish designed, you must take a closer look at this beauty. Made from beech and oak wood, this adorable canine sports soft leather ears and a pristine round base. OyOy Leika Dog, $69 from Design Stuff. 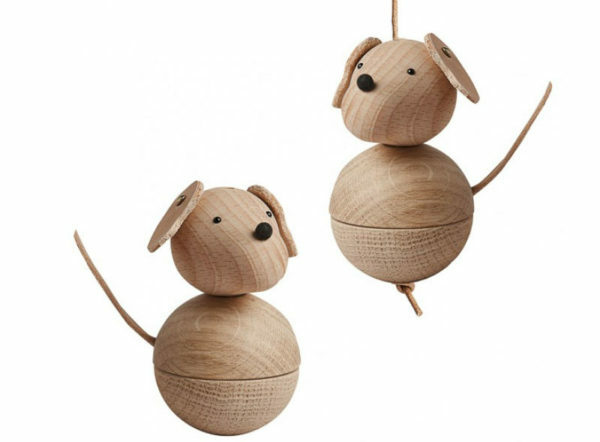 Have a rolling good time with the Zigolo Dog Roly Poly Stacker from Janod. A sweet tinkering bell and a very round belly, this is one precious pup! Available from Cocoon Petite Living, priced $45. 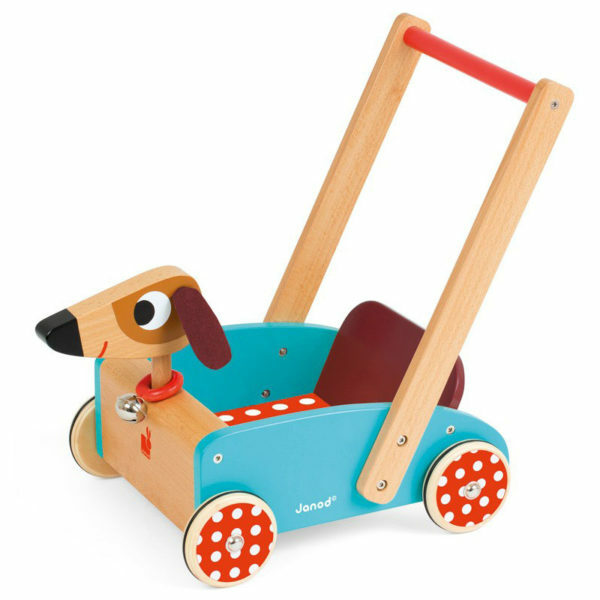 The quietest Jack Russell you ever laid eyes on, the Crazy Rocker Pull Along Dog is sure to have your little one in a fit of giggles. Priced $69.99 from Entropy. If the kids have been pestering you for a puppy, this could well be perfect for buying yourself some time. 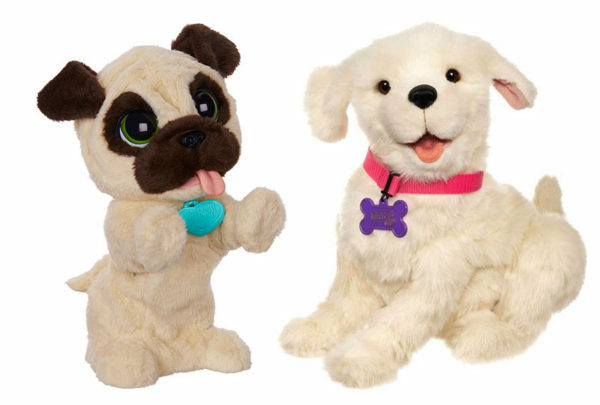 Hasbro’s FurReal Friends JJ Jumpin’ Pug and Cookie My Playful Pup are just a couple of interactive pups available at leading department stores such as Kmart, priced from $69. For a puppy soft, cuddle and very, very smart, look to Fisher-Price. 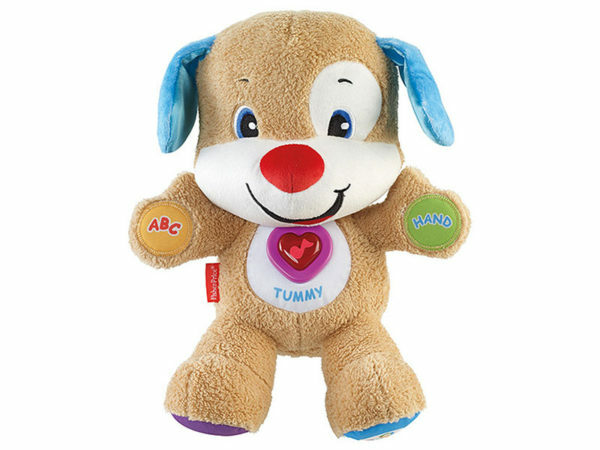 The Laugh and Learn Smart Stages Puppy has all the bells and whistles, perfect for entertaining baby! Find it at Target, $35. 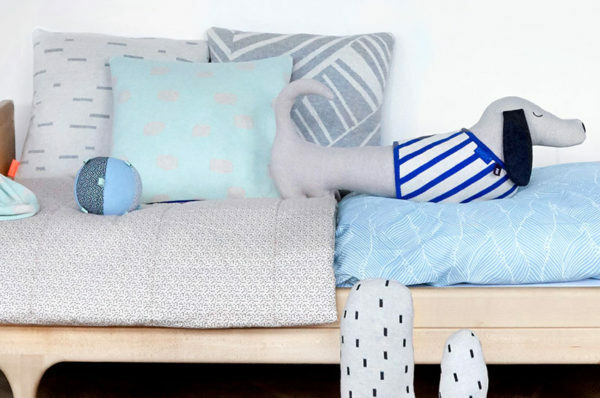 Part soft furnishings and part friend for life, the Oyoy Cushion Slinkii Dog is possibly the cutest cushion I ever did see. Looking ever so dapper in his striped coat, he’s priced $99 from Leo and Bella.